Massimo Bottura is not your normal run of the mill chef. He is a man with a vision – combining modern art with avant-garde cuisine while at the same time respecting nature’s provenance. Having quit studying law after finding that a trattoria was up for sale on the outskirts of Modena he has gone from strength to strength reaching the pinnacles of international cuisine by reconstructing Italian traditions and humble ingredients into something one can be awed with. Like an epic football final or a brilliant art exhibition where you would continue to talk about it until your friends get fed up, Bottura’s food has a somewhat similar effect. Bottura has a simple philosophy – follow your passion and express your emotions in what you do. You can only admire him for this. He resonates this philosophy when you enter his world. It is probably the dream of many people who are stuck in their daily routines to do what they would love but who might not have the courage to follow their passions or express themselves. Can food be art? What turns humble ingredients into greatness? Can you break preconceptions while at the same time respecting tradition and history? What eventually makes a meal memorable? The Osteria Francescana makes you ask these questions and much more. This to me was always going to be much more than a restaurant. The reservation was made a few weeks after I turned 40, the booking was only a few days after my wife and I had celebrated our 7-year wedding anniversary. And we were going with two dear friends. While not being too bothered with celebrations, the expectations for a 40-year-old at maybe the turning point of his career where huge. The restaurant is hidden in one of the pretty alleys of the unpretentious but incredibly welcoming streets of Modena. Here, in the land of fast cars and slow food, you can be lost in thinking that time stood still. Whether it’s the traditional Aceto Balsamico from Modena, the Parmeggiano Reggiano from the region or even the different types of hams, you can find exceptional produce which ages gracefully. The experience was unforgettable in more ways than one. At Fulvio Pierangelini’s Gambero Rosso, which alas no longer exists, I beat a phobia which had the potential to ruin the pleasure of gastronomy. Until that time, I had a phobia of cheese, not an allergy but rather a psychological condition. But at that restaurant I had vowed to eat whatever was served. All was going well until the kitchen decided to send an amuse bouche before the main course of suckling pig which I still can remember like it was yesterday. But more about that story another time. At Osteria Francescana, I graduated with Honours when it comes to cheese. 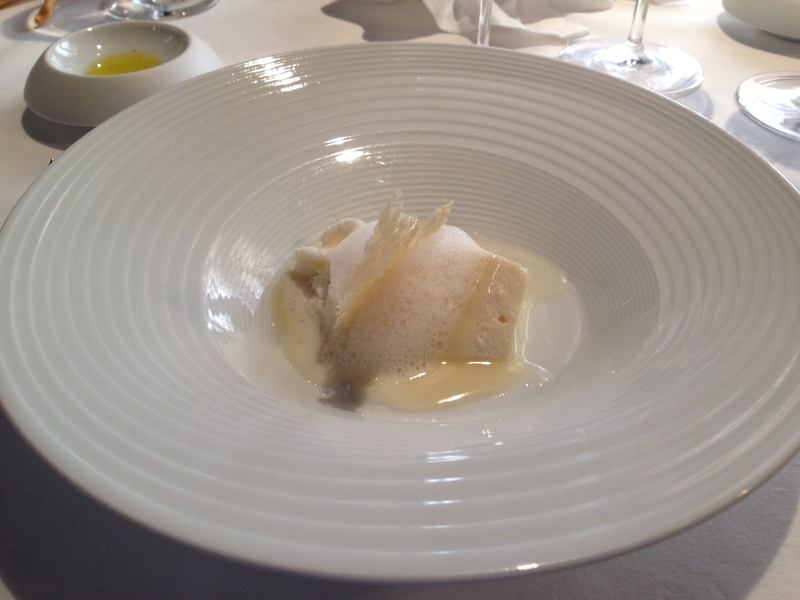 The five ages of Parmeggiano Reggiano served as one of the courses was simply out of this world. In its simplicity, it was a celebration of just one ingredient but the textures, different temperatures and different taste where such as to wow you into a sense of wonder. The idea alone was incredible. The execution of that idea was perfect. How could the chef have created such a dish? How did he even think about it? The dish was clever but not too clever. The presentation was harmonious but at the same time bland. The flavours, textures and temperatures did all the talking. And what a speech they gave. I will blog about the whole meal in a separate post first for me to record what is one of my greatest culinary experiences and secondly to encourage you to see for yourself the effect Massimo Bottura’s philosophy has on the food and help you to get out of your comfort zone because this is exactly what Massimo Bottura does. You need to think more about the providence of food and how to reinterpret certain dishes, including by not necessarily following precise recipies. Was this the pinnacle? I don’t know. On the one hand, I don’t want it to be. What is certain is that I will return to try different interpretations of dishes which were not served. One lesson which I take from the experience however is that of why it is so difficult to succeed in the restaurant business. Massimo Bottura was not there when we visited. How did we know? We asked. Did we guess he was not there? Not really though with the benefit of hindsight we should have guessed. In such a well run kitchen, everything works to perfection. And this was clearly the case this time as well. The service was impeccable and all the dishes were executed to perfection but the finale went missing. The first sign of our hindsight lesson is that we were encouraged not to take the 12-course sensations menu. The second is that we were served 11 dishes, one of which was a dessert which was good but not memorable and clearly not in sync with the crescendo of dishes which just seemed to get better and better. In my view, this was meant to be a pre-dessert. I stand to be corrected but upon reflection, discussion and menu counting we came to the conclusion that we had not been served the main dessert probably because it was getting late and the chefs wanted to close the kitchen. For those who are familiar with Bottura, it was maybe a case of “Ooops I forgot the lemon tart”. A slight disappointment to an otherwise impeccable meal. As the saying goes, when the cat is away the mice come out to play. And that clearly is the difference between passion and work. A passion which Bottura has in droves.